the outskirts of Taunton towards Minehead then take the road to Porlock. Just out of Minehead you will find yourself travelling on a wide straight piece of road. Continue to the brow of the hill where there is a four cross way. Carry straight on towards Porlock and take the second turning on your left marked Luccombe. Just follow the signposts firstly to Luccombe and then Cloutsham. You will go through the pretty village of Luccombe and then up a fairly steep hill to Webbers Post. Take the Cloutsham road, go through the ford and up past Cloutsham Farm. If you find yourself in Horner you have missed the left hand turning to Cloutsham. On reaching Cloutsham Farm carry straight on until you come to a cattle grid. Turn right immediately after this cattle grid and Church Farm is about half a mile on the right hand side of the road next to Stoke Pero Church. There are steps leading from the road to the garden and entrance porch serving the self-catering accommodation at Church Farm. 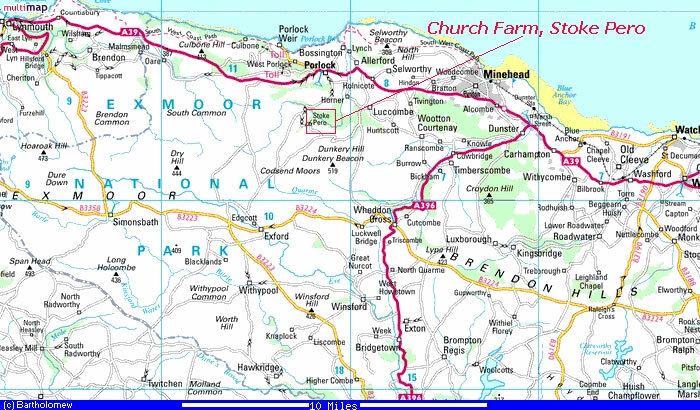 It will take you approximately 20 minutes to travel from Minehead to Stoke Pero. please leave a message if I am not there.